Rachel Darr ’20 with Justice and Asbury Trainer-in-Residence Jesse Westfall. Each year, hundreds of foals are taken away from their mothers and abandoned — an issue that has plagued the equine industry for years. Horses that will thrive in breeding or racing are highly sought after, leaving foals with less desirable “worth” to suffer as orphans. In every seemingly hopeless situation, though, hope remains. Through Asbury University’s renowned Equine Program, one of those foals — aptly named Justice — is beating the odds. In 2016, internationally recognized horse trainers Stacy and Jesse Westfall visited Last Chance Corral, a horse rescue center in Athens, Ohio, that specializes in rescuing nurse mare foals and other neglected horses. A nurse mare foal is a foal that was born so that its mother might come into milk. The milk is then used to nourish the foal of another mare, usually a thoroughbred that might succeed in the racing industry. The nurse mare foals are usually left to die as a result. The foal in question was named Presto. When the time came for the Westfalls to adopt him, however, he was highly ill.
Due to his illness, Presto could only be adopted with another foal, who could give him the essential emotional support needed to help him recover. So, the Westfalls took a look around the paddock at Last Chance for a second horse to bring home. 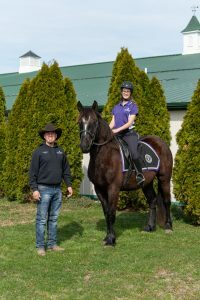 “Immediately, I thought of taking one that would work for Asbury University’s Service Mounts Program to become a police horse someday,” said Jesse, who serves as the Asbury Trainer-in-Residence. That second foal was Justice, who had been taken from his mother at three weeks old. The Westfalls spent the next few months raising Presto and Justice at their home with round-the-clock feedings. After being trained up by the Westfalls, Justice moved to Asbury’s 343-acre Equine Center to begin the next phase of his life. Rachel Darr ’20 with Justice and Asbury Trainer in Residence Jesse Westfall. In the fall of 2017, Justice was introduced to Rachel Darr ’20, a student in the Service Mounts Training Program. Though he didn’t make the best first impression on his new trainer and was readily labeled the “ugly duckling” of the barn, it quickly became evident that God brought Darr and Justice together for a reason. Over time, Darr and Justice created a special bond that helped Darr grow as a trainer and Justice progress rapidly in his training — a proven structure using riding, ground work, obstacles, street work and desensitization techniques to prepare horses for service in police units. 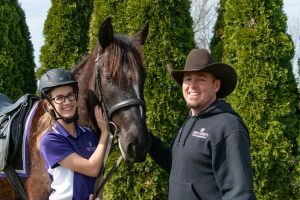 Darr, a double major in Equine Studies and Music who also happens to have Asperger’s Syndrome, struggled to connect with other children during her school years and found a special connection with horses when she began riding at age 12. As for the dynamic duo of Presto and Justice? They were reunited last year at the Equine Affaire event in Ohio. Justice also reunited with Jesse’s horse Lucy, who came to Asbury for some demonstrations during the fall semester. Now, Justice is finishing up his police horse training and is in the process of being purchased by Sergeant Sage Bourassa of the Placer County Sheriff’s Office in Auburn, Calif. For Bourassa, whose personal and work animals are all rescues, it was Justice’s past as an orphaned foal that especially stood out. Justice will not only become Bourassa’s police horse, but also her personal horse and, as she puts it, a part of her family. Through the love and care of Last Chance Corral, followed by Asbury’s Service Mounts Training Program, Justice has grown from a cast-off foal to a capable police horse — and, just like his student trainer, he’s ready to impact the world. Learn more about Asbury University’s Service Mounts Program by visiting asbury.edu/mounts.